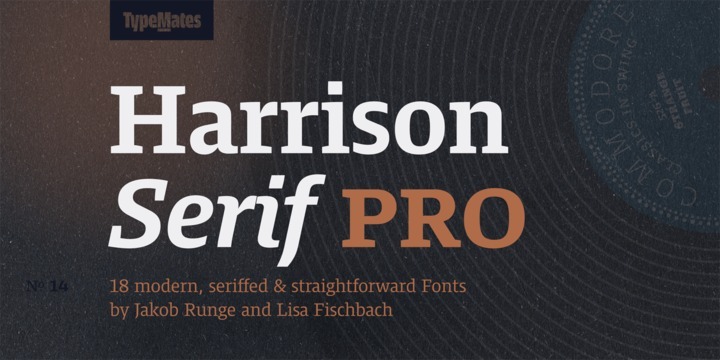 Harrison Serif Pro is a slab serif typeface created by Jakob Runge together with Lisa Fischbach and published by TypeMates which is available in 9 weights (from Hair to Ultra) with accompanying italics, a variety of OpenType features and language support. This contemporary typeface comes with a humanistic tounch, and is suitable for editorial use, typographic purpose, screen design, but also for advertising & branding. Enjoy! Price: starting from $55,00 for one font to $349,00 for all 18 fonts. A font description published on Monday, August 14th, 2017 in Fonts, Jakob Runge, Lisa Fischbach, TypeMates by Alexandra that has 2,663 views.